Nik Bryant is a Northwest based wedding photographer that wanted to refresh his current website with a view to increasing his ranking for industry-related keywords. To make this happen we had to have a clear strategy for driving enquiries through the new website through one of our web design Manchester offerings. The biggest mistake most photographers make with their website is to make it entirely image focussed. The images are what will keep visitors on the website – The trick is getting them there in the first place. This meant writing content that would generate results for the search engines, whilst placing the photos in context. 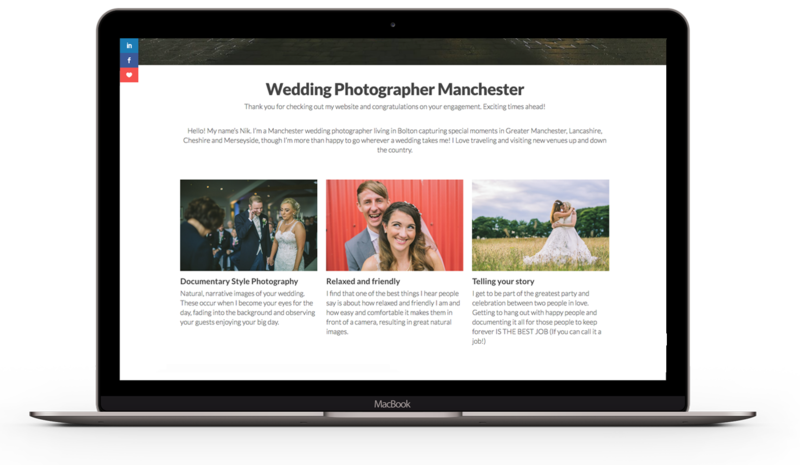 With a well-optimised website, the onus now is to create engaging blog posts that showcase Nik talents, while also generating more content that contains local venues and locations. As we know, these blogs get shared by a lot of the guests at weddings, creating its own publicity and social sharing.